A shotgun misfires inside the American Fur Company store in Northern Michigan, and Alexis St. Martin’s death appears imminent. It’s 1822, and, as the leaders of Mackinac Island examine St. Martin’s shot-riddled torso, they decide not to incur a single expense on behalf of the indentured fur trapper. They even go so far as to dismiss the attention of U.S. Army Assistant Surgeon William Beaumont, the frontier fort’s only doctor. But in the name of charity and goodness, Beaumont ignores the orders and saves the young man’s life. What neither the doctor nor his patient understands—yet—is that even as Beaumont’s care of St. Martin continues for decades, the motives and merits of his attention are far from clear. In fact, for what he does to his patient, Beaumont will eventually stand trial and be judged. 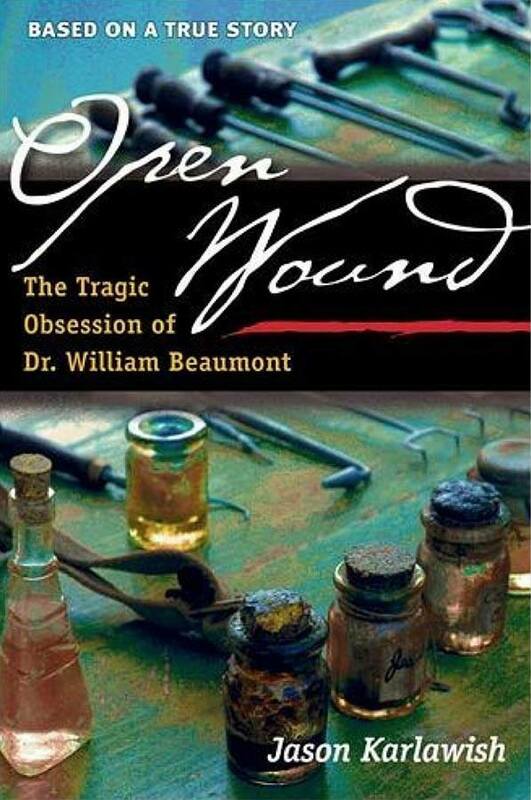 Rooted deeply in historic fact, Open Wound artfully fictionalizes the complex, lifelong relationship between Beaumont—a prominent figure in Michigan’s medical past and present—and his illiterate French Canadian patient. The young trapper’s injury never completely heals, leaving a hole into his stomach that the curious doctor uses as a window to understand the mysteries of digestion. Eager to rise up from his humble origins and self-conscious that his medical training occurred as an apprentice to a rural physician rather than at an elite university, Beaumont seizes the opportunity to experiment upon his patient’s stomach in order to write a book that he hopes will establish his legitimacy and secure his prosperity. As Karlawish portrays him, Beaumont, always growing hungrier for more wealth and more prestige, personifies the best and worst aspects of American ambition and power.